Along with the DPRK, Transnistria was one of the places I was most curious about. The first time I heard about the place was in a very short article in Monocle Magazine, no more than 2 paragraphs long. But after a night of internet browsing increased my knowledge a tad, my interest in the place grew and I knew then that if I ever found myself in Moldova then Transnistria was a 'must see'. Plus my Norwegian friend 'S' (who was mentioned in a previous post here) had been on a work trip, so I knew that a visit would be possible and worth it for a non-Russian/non-Romanian speaker. For those not clued-up, Transnistria is this tiny sliver of land that borders Moldova on the west and Ukraine on the east. After the USSR collapsed, tensions rose between those on the west of the Dniester river (Moldova, who had declared itself independent shortly after) and those on the east of the river, who still wished to remain part of the Soviet Union. After a 4 month war in 1992 a ceasefire was declared, talks were held, but the political status of the territory was still unresolved. This territory, having declared itself independent 2 years before the conflict, is only recognised by three other Soviet 'frozen conflict' territories - Abkhazia, South Ossetia and Nagorno-Karabakh. The other 200+ sovereign states recognise Transnistria as a part of Moldova. They have their own army, their own currency, and they even have legitimate Transnistrian passports for citizens. Whilst I knew it would be an achievable trip, I only had about four days in Chișinău, and had heard that there were problems with the border controls in Transnistria, particularly for those travellers arriving via the main road from Odessa, Ukraine. After 8 years of travelling to some varied, awesome, modern and underdeveloped countries, one of the things I have managed to avoid so far is the payment of a bribe. At least by taking a guided tour I would avoid such a confrontation, pass through border controls relatively quickly and had someone with local knowledge guide me around the state. I chose Andrey at Transnistrian Tours, who through my research was the only guide I could find that was born and raised in Tiraspol. He picked me up in Chisinau in a 30 year old Honda that had seen better days, and with a couple of turns onto the R2 motorway we were on our way to Pridnestrovskaya Moldavskaya Respublika. Hearty spinach soup from 7 Fridays in Tiraspol. Isn't that the most glorious green colour? I shared a pizza with Andrey at the restaurant and it was tasty as well. Tiraspol Theatre, where on the 2nd September 1990 the state of Transnistria was declared an independent state. Taras Shevchenko University, the main university in Transnistria. Being a Sunday on the day of my visit, the university was closed, however with Andrey being a former student, he managed to have a nice talk with the security guard and I was treated to a tour of the interior. Having been founded in 1930, there are many references to the Soviet union. Throughout the university, there are quotes and portraits from Ukrainian poet Taras Shevchenko, Romanian poet Mihai Eminescu and Russian Poet Alexander Pushkin. The Transnistrian National Anthem line the walls, translated in Ukrainian, Russian and Romanian. And just adjacent to the university is the Bulevardul Gagarin, where a bust of the USSR's most famous cosmonaut stands. A monument commemorating famous Transnistrians, including the first President Igor Smirnov. 'Dom Sovetov', translated as the House of Soviets, the Parliamentary building of Transnistria, with a bust of Lenin displayed prominently at the entrance. Afterwards, Andrey took me to Kirov Park, and I really did feel as if I had gone back in time. Adding to the visit was that being played on speakers throughout the park were children's songs - all in Russian of course - that Andrey had said reminded him of his childhood. There weren't too many people in the park but it was nice to just stroll around in the sun and to breathe in fresh air. I guess with my visit being in October the park wouldn't have been as buzzing as it would have been during the height of summer. The statue featured is of Sergei Kirov, one of the main Bolshevik leaders in the USSR who was assassinated during Stalin's time. The Suvorov Monument, featuring Alexander Suvorov, who founded Tiraspol in 1792. The building and plaque are significant in that it is the only government building plaque that has a translation in English. A bust of Nikolay Zelinsky, inventor of the gas mask. Greatly revered in Transnistria, there's even a museum here in his city of birth, but I was lacking the time to visit. Eternal Flame at the war memorial in the central plaza of Tiraspol, commemorating those that lost their lives during conflict in Tiraspol in 1941 and 1944. Orthodox Church in the central plaza on 25th October Street. Apparently there is a larger church on Shevchenko Street, but this is the most popular church for Transnistrians to get married in, as it has a nice view of the river and many famous monuments of the country are located very close to this church, so provide the best photographic opportunities. I asked Andrey if he had his wedding in the church, and he said he did. I'm sure it would have been particularly special, this street is the lifeblood of the city of Tiraspol and with every weekend there being a wedding in the church (and indeed there was a wedding when I visited), to finally get your day would have been something. He had a bit of a twinkle in his eye when he talked about his wedding day too. So along with the Suvorov monument there is this T-34 tank that dominates the plaza, placed here to commemorate the Soviet victory of WW2. There were some 84,000 produced in an 18 year period. Mainly due to the sheer number that were built, but also due to it's efficiency and design, there still remains hundreds of tanks that are still operational, many of which are in private ownership. Dniester River, from which Transnistria adopted its name. The sandy bank to the right of the photo is popular for swimmers and sunbathers during the summertime. At around 8 degrees Celsius during my October visit, whilst it was nice and sunny, it was perhaps a bit too cold for sunbathing. After the tour was coming close to the end, we went to Bendery for a last minute Kvint run. A branch of the Sheriff supermarket. The Sheriff company are the second largest business in Transnistria (I presume that Kvint are the largest) and it's not hard to see why - they have a monopoly on the supermarkets and petrol stations, plus they have a TV station, a mobile phone network, a (very successful) football club and a massive football stadium. When I first heard the name of the company I, for some reason, thought it was pronounced Sharif, as in the actor Omar Sharif. After a moment thinking as to why a proudly Transnistrian company would give itself an Arabic name, I then realised my mistake when I saw the logo. Also spotted in Bendery, a stretch limo, seemingly permanently parked at a petrol station. I didn't see any wedding parties at the capital with limousines waiting, so I wonder when it would be used? A bottle of Transnistria's best export, Kvint cognac. 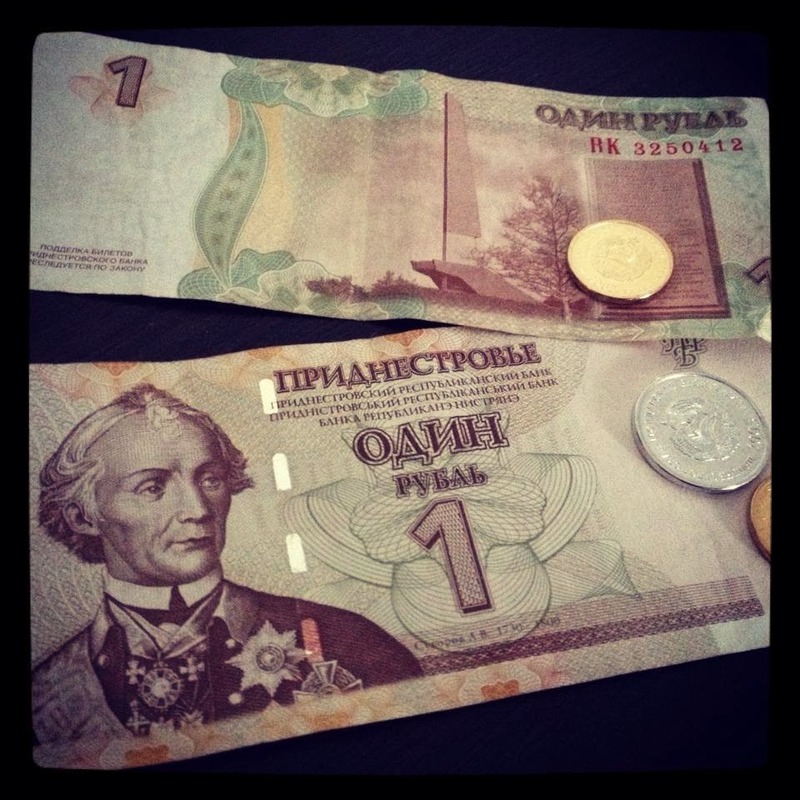 So famous that the factory has even been featured on the Transnistrian rouble. I don't really drink cognac, I have a bottle at home for cooking gravy and what not. Then Christmas in Dubai happened, and they were selling Borden Egg Nog seemingly everywhere so I decided to buy a single serve, took it home and mixed in some Kvint - WOW, just WOW. The bottle is only 1/4 full now, so you guys can tell I had a pretty good Christmas! 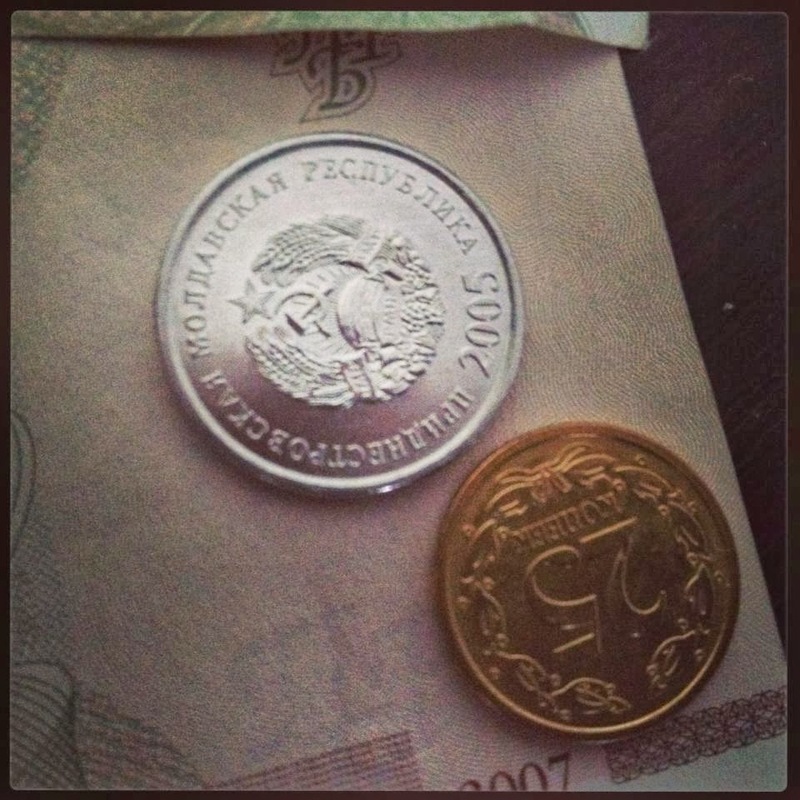 Just in case you were at all curious, this is the Trasnistrian Rouble, plus some kopecks. As you can see on the Rouble, it has the founder, Alexander Suvorov, and on the kopeck there is even the Soviet hammer and sickle. The trip to 'The State That Doesn't Exist' certainly didn't disappoint, and a large reason for that is mainly due to my tour guide, Andrey. Had I attempted to make the trip alone, there would have been frustrations that would have possibly given me a negative impression of the territory, whether it be with the mashrutka trip, the border guards asking for bribes, not knowing anyone that speaks English, not knowing any Romanian, Russian or Ukrainian to ask for directions. I wish I had more time to spend there, particularly to check out the Kvint factory and the Zelinsky museum, but overall, if you happen to be in Moldova, for whatever reason, make the effort to visit Transnistria - if only to see what a visit to an unrecognised territory is like, and how it could possibly happen.